Crack down on public transport vehicles screening pornographic films – Kenyatta University TV (KUTV). All Rights Reserved. 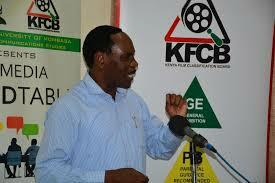 The Kenya Films Classification Board (KFCB) has commenced a countrywide crackdown on public service vehicles screening obscene films. KFCB Chief Executive Officer (CEO) Ezekiel Mutua expressed concern that public transport vehicles were screening film contents interspersed with pornographic clips. He said the crackdown follows complaints from the general public who has reported numerous cases of obscene content exhibited in public transport service. ‘It is disturbing and totally unacceptable for public service vehicles to play pornographic content in utter contravention of the law’ he said. Speaking to the press in Mombasa the CEO of the film regulator said the board will also be taking aim on those who play their music too loudly. He said it is the requirement of the law that any media content that is displayed to the public is submitted to the board for examination and classification. Mutua said most public service vehicles have not complied with the requirement and have continued to subject commuters to unrated and obscene content against their wish. ‘The screening of obscene content to the public goes against the stipulation of the Films and Stage Plays Act Cap 222’ he noted. KFCB regional coordinator Boniventure Kioko film officials and police have impounded 40 public service vehicles in Mombasa where drivers and conductors are expected to be arraigned in court to face charges of exhibiting unclassified video content. Members of the public interviewed have welcomed the crackdown saying the pornographic content played on matatus was corrupting the morals of the youth especially school children. Others have called for the removal of the film screens in the PSVs as they were corrupting the moral of school children.